The perfect romantic gift for any couple. 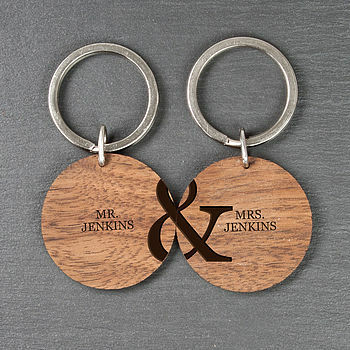 A set of matching Keyrings made from Walnut Wood and hand personalised just for you. The & sign comes as standard on each keyring and you can have Any Name personalised on each Keyring. This will make a unique gift for any occasion. This product is dispatched to you by The Letteroom.